My husband is one of those people that is difficult to buy for, though he thinks he isn’t. I mean what do you buy for the man who has everything? And I mean literally everything he wants (bar time and a chance to poo in peace with the little ones around), and if he wants something he just goes out and gets it. Even when it’s three weeks away from Christmas. It is infuriating. Though we have our standard presents, golf balls, a new running top, running socks. Fail safe. Always required. Always appreciated. Then this year he went and broke his foot. No running. No golf. No football. No gifts. What is a girl to do?! Just how do I go about buying for the man who has everything, and buying something which isn’t socks!! Well that is where Uncommon Gifts comes in, with over half of what is sold made by hand, a unique and special gift was bound to be making it’s way under our tree. And they are indeed, as I type some very special presents are en route to me in Qatar (yes they deliver to the Middle East people!!) ready to go under our Christmas tree. Seeing as I have finally sorted out something for my man who has everything I thought it might be an idea to help you out. 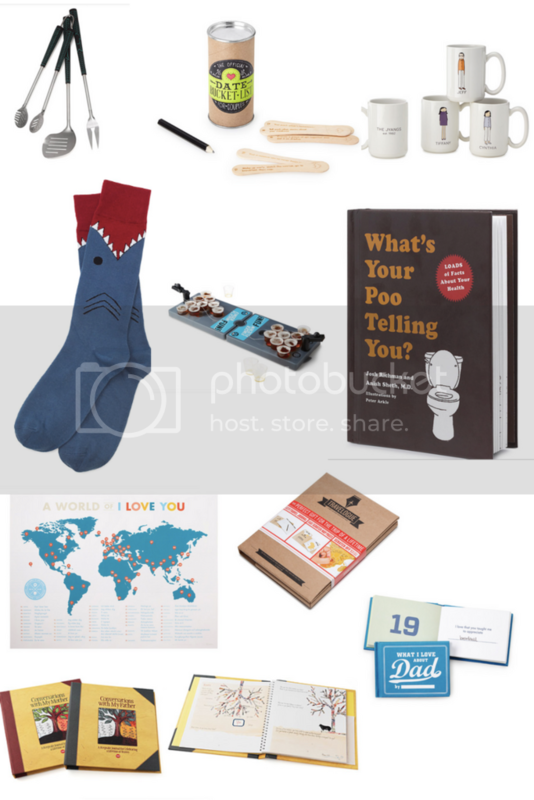 I’ve even got technical and if you click on the photo it takes you to the specific link – clever right – from gifts specially for Dad to gifts for the man in your life I’ve picked a little bit of everything, for the man who has everything. The poo book; men and poo. What more do I need to say? A World of I Love You; a way to map out the places you’ve travelled together. Scratch Travel Journal; recording those travel memories. *this was written in collaboration with Uncommon Goods, all opinions and stubborn husbands are my own and my whole Christmas gift to my husband is currently winging it’s way to me from Uncommon Goods – eeep! Love this and you’ve certainly given me ideas for my dad. Thank you.